For a little while, I have been thinking of reviewing an urban fiction book for Friday Reads. Not that I am an avid urban fiction reader, because I am not. But rather this is a specific genre of fiction that no one has ever reviewed on FR. Urban fiction, for me at least, is very difficult to read, but I finally made it through one to write about it here. First, a basic definition of urban fiction. Sometimes called “hood books” or “the good books”, urban fiction often tells stories of inner cities, typically graphic in nature and tackling issues of poverty, abuses (drug, domestic, and others), crime, hustling, and street life. A number of urban fiction books have been written by authors while in prison. The challenge here is that for me some urban fiction is just plain unreadable. I tried numerous books and did not get very far into them before giving up. Some examples: True to the Game series (didn’t make it to chapter 2), The Thug Series of books (I tried a few, including Every Thug Needs a Lady, Honor Thy Thug, and Justify My Thug), and the Girls From Da Hood series (I thought they must be decent because there are 13 of them – unfortunately in my opinion they weren’t readable). 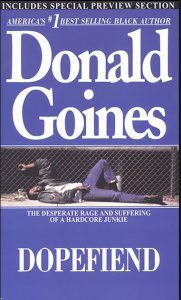 About to give up, I finally decided to try Donald Goines’ classic Dopefiend, published in 1971. While I made it through, I cannot say I would recommend it overall. However, it might serve a purpose in a scared straight sort of fashion, maybe to high school or college aged students. Dopefiend tells the story of a group of addicts in an inner city (Detroit) in a raw and graphic manner. The story mostly follows the decline of the main character Terry, spiraling downward into the depths of her addiction. Most of the story is disturbing, following not only Terry but also the side characters Teddy, Minnie, Porky, Snake, and Dirty Red. The story involves numerous crimes to support their habits, lies and ruined relationships, exploitative drug dealers, and prostitution. For me it was reminiscent of parts of Requiem for a Dream (both movie and book). While the depiction in Requiem for a Dream consists of mostly white characters, the characters in Dopefiend are overwhelmingly African American. Dopefiend is uncomfortable on many levels. 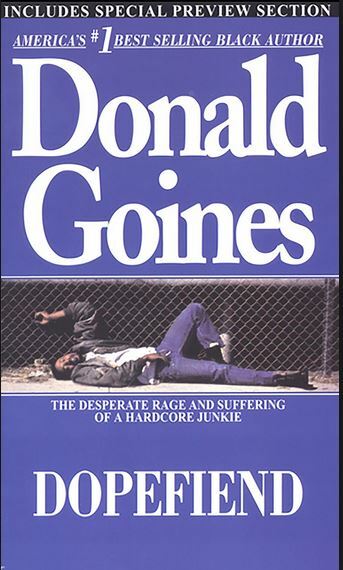 I will say that after trying to read contemporary urban fiction, which often glamorizes the life of the hustler, Goines paints an entirely darker and realistic picture in the opposite direction.